In sad and arresting news for lovers of film and of good, honest, nuanced writing, famed movie critic Roger Ebert has died at the age of 70. Afflicted with a tenacious and ultimately fatal case of cancer in his thyroid and salivary glands, Ebert’s illness transformed his kindly professorial appearance and even prevented him from speaking, but never proscribed his ability to express himself. Indeed, Ebert underwent what we can now unfortunately call a late renaissance as a writer and disseminator of ideas in recent years, embracing the opportunities presented by the Internet to redouble the voice that keenly dissected movies on television and in the pages of the Chicago Sun-Times for decades. His Twitter (now silenced) was an unspoken must-follow, and his website expanded beyond his own reviews to include those of many acolytes (including his last regular television review program co-host, Richard Roeper) as well as essays on politics and other contemporary subjects worthy of his particular commentary. As the cancer that would take his life spread, so did his considered words, his clear-eyed reason, and his legacy. We give you a thumbs up right back, good sir. It’s delusional for me to place my modest critical efforts anywhere near those of the United States of America’s foremost film critic. But I can’t say that I have any doubts that were it not for the influence of Ebert’s reviews in my formative years as a writer, I would not be writing about the movies today, or likely producing criticism of any stripe. If it has not done me much good professionally, then that is my failing and not Ebert’s. In my pre-internet days, I watched Siskel & Ebert and devoured his movie yearbooks, absorbing not only his perspectives on movies (which I often disagreed with) but also the subtle turns of his prose rhetoric. Roger Ebert did not write the greatest reviews for the greatest movies (although his commentary track for Citizen Kane is a must-listen for appreciators of one of Hollywood’s greatest moments). His opinions on Peter Jackson’s epochal Lord of the Rings trilogy, for example, were hopelessly quaint and outdated, and his reviews in general fell in my estimation after he championed the staid and limp first Harry Potter film (“the new Wizard of Oz” or some inert praise to that effect) over the clearly superior Fellowship of the Ring (read Stephanie Zacharek’s take for Salon on the latter for a review shot through with transcendent and erudite awe at greatness). But he could dismantle a poor cinematic effort with velvet gloves and a surgeon’s knife. No wonder that his latter days saw him directing his powers more and more at the fever of Republican madness infecting American political and social life with the same righteous rhetorical scalpel. 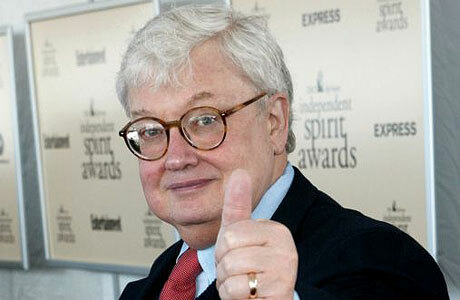 More than anything, though, Roger Ebert outlived the public utility of his profession. His stated goal with Siskel & Ebert, with its famously reductive thumbs-up/thumbs-down summary judgements and edited critical discussions, was to bring the often stuffy, smug and ungenerous craft of film criticism to the people. His direct writing on the movies he watched and either loved, loathed, or often found lingering in the liminal space between those poles empowered readers and film fans (present blogging company included) to form and express their own interpretations and opinions on American culture’s foremost entertainment product. His own work spread easily to the internet, and he championed online film writing as a necessary and exciting form even as it rendered the formerly privileged position of the paid traditional media critic almost entirely vestigial. There are some great stories about this sector of his public work at Ain’t It Cool News, a movie fandom site that Ebert spoke glowingly of on many occasions. Largely due to these efforts of democratizing and decentralizing film criticism, Ebert is likely to be last hugely prominent film critic in pop culture. No longer do filmgoers wait patiently to read what a New York Times critic like Pauline Kael has to say about a movie before judging it for themselves. If they ever did, that is; if anything, film criticism has had to work hard to catch up to the public’s clear-cut assessment of cinematic product, with populist writers like Ebert at the head of that column. Hundreds of critical perspectives of varying degrees of sophistication and positivity can be accessed with a single online search, including those of major media critical voices. The cultural capital of the movie critic has been drained away, ironically thanks to the passion for myriad views on film felt by the man who held more of that capital than anyone else. Writing about movies, as this humble if long-winded blog proves, is no longer merely the province of the privileged. Perhaps Roger Ebert would have appreciated that more than any other part of his legacy.